Begusarai, April 2 (IANS) Situated on the northern bank of the Ganga river, Begusarai in north Bihar has earned the "Leningrad of Bihar" and "Little Moscow" monikers, and is again drawing national attention because the CPI has fielded its firebrand leader Kanhaiya Kumar while the BJP has pitted against him its top Bhumihar leader and union minister Giriraj Singh. In all this, the RJD's Tanveer Hasan, the 'mahagathbandhan' candidate, may not be creating much media hype, but his presence has made the contest traingular and also dimming Kanhaiya's chances as the anti-BJP votes are likely to be divided between the RJD and the CPI. Kanhaiya, a former president of the JNU Students' Union, came into the limelight after his arrest for an "anti-national sloganeering event" on the campus in 2016. His emergence as a youth leader fuelled hopes in the CPI of its revival and the party fielded him as its candidate. The "anti-national" tag has stuck with Kanhaiya after the JNU incident and this was perhaps the reason Prime Minister Narendra Modi and BJP President Amit Shah decided to field Giriraj Singh, seen by many as an anti-Muslim face in Bihar, from Begusarai despite his wish to re-contest from Nawada. So, how did Begusarai get its monikers? It was from the prolonged struggle between the landless and the landlords organised under the banner of the communist parties. The BJP's Bhola Singh won the seat in 2014, defeating Tanveer Hasan by a margin of over 58,000 votes. Bhola Singh, a former Communist leader, had switched sides to the BJP. With 34.31 per cent of vote-share, Hasan secured nearly 370,000 votes while Bhola Singh got nearly 428,000 votes or 39.72 per cent. The CPI's Rajendra Prasad Singh with nearly 200,000 or 17.87 per cent of the votes. Before the last delimitation in 2009, there were two parliamentary constituencies in Begusarai district - Begusarai and Balia. They were then combined as Begusarai while Balia ceased to exist. Five of the seven Assembly seats of Begusarai district used to fall in Balia. 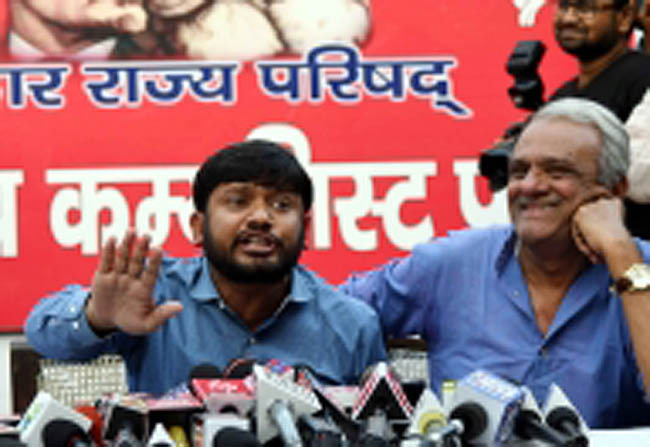 The CPI had hoped that the RJD would not field any candidate to make Kanhaiya's win a certainity, but it announced Hasan's candidature. But the RJD won't have it easy too. Due to a large industrial presence in Begusarai, the trade union movement has dominated the political discourse in the area and the CPI has a strong mass base.